Chocolate, and what it means to people, differs across time and space. From its inception as the seeds of a fruit tree to the myriad ways in which it is transformed and eventually consumed by humans, chocolate’s potential variety seems limitless. The history of chocolate merits this variety; it is a fascinating story across multiple continents and cultures. What becomes ever more apparent when studying chocolate’s history as a food, and potentially as a healthy food, is that human obsession with food – in general, but more pertinent to this paper as a source of health – is no new phenomenon. The Western diet has undergone huge transformation since the industrial revolution, chocolate was transformed along with it, and both have not slowed in their development. When chocolate was first encountered by Europeans, the scientific reasoning behind food knowledge was based on a 1500-year-old system developed in Ancient Greece and Rome. Today, modern science allows us to measure the nutritional content of anything and everything we can think of ingesting. But, alas, this technological exactitude has not led to uniform consensus when it comes to which foods are healthy and which are not. Diversity, in both our options of foods and the opinions on which of them we should choose to consume, still reigns supreme. This paper will track chocolate, from its birth place to the continents where it is now most widely and voluminously consumed, and attempt to appraise its value as a beneficial dietary supplement. It will also discuss what effect the perception of chocolate as a health food might have on the industry today. What becomes apparent is that, while Galen’s humours may no longer hold sway in the scientific realm, the Hellenic wisdom from Apollo’s temple that prescribes, “Everything in Moderation,” is as true today as it was two thousand years ago. According to Michael and Sophie Coe, in their exhaustively well-researched book, The True History of Chocolate, feelings have been mixed about the legitimacy of chocolate as a health food for a long time. The Aztecs, who did not discover or invent the cacao seed and its most valued product, but were controlling the product across its empire with an iron fist, did not view chocolate as a panacea like some Europeans came to do. For the Aztecs, the chocolate drink, as it was consumed then, was taken chiefly as a preferable option to wine – drunkenness being hugely frowned upon (Coe: 75). There were some supposed benefits, that were reported by the Spanish mendicant friars, including increased “success with women” (Coe: 96), and as a cooling drink that could be taken before hard labour to avoid overheating (Coe: 123). But there were also warnings against chocolate, with a myth purporting that chocolate had made Aztecs fat and weak, distancing them from their superior forebears (Coe: 77). In Europe, chocolate arrived as a medicine (but Coe notes, “it soon became a medicine that was appreciated for its taste, its filling nature, and its stimulation, 126). However, the guise under which it came, the now utterly refuted Galenic humoral system, makes its supposed benefits interesting but not pertinent to this discussion. To sum up briefly, chocolate was claimed to benefit a host of ailments including: angina, constipation, dysentery, dyspepsia, kidney disease, liver disease, breast and stomach illness, asthenia, indigestion, fatigue, gout, haemorrhoids, erectile dysfunction, and the list goes on.1 It was not until modern medical research took root in the 19th century that false claims started to become harder to make (though they have never been completely extinguished). So what claims can be made about chocolate? Unfortunately, because chocolate in the United States only has to be 10% or more made from cacao, very little can be said uniformly about chocolate.2 So it is important to clarify that the only chocolates that can be said to have possible health benefits (at least benefits that derive from the cacao) must be those produced with a significant cacao content. Much has been said recently about the health benefits of dark chocolate, some of it true, some of it exaggerated, and some of it quite misleading. If one googles, “dark chocolate health,” the vast majority of articles one will find will boast of the “superfood” qualities of high cacao content chocolate or of the benefits of adding raw powdered cacao as a supplement to one’s diet.3 The nutritional properties of cacao most touted are its antioxidants – polyphenols and flavonoids – with claims that they are good for cardiovascular health, protection from disease, anticancer properties, lower cholesterol, cognitive health, and lower blood pressure.4 Antioxidants has become a “buzzword” in the health community, especially the health selling community, and so anything that can be provably claimed to contain antioxidants and can also be produced and sold will appear in advertising before long. However, scientific research results have not proved as exciting as the claims of fitness and holistic-living “experts.” The antioxidant immunity boost from chocolate has showed to be extremely short-lived in humans5 and studies have revealed, like that of red wine’s supposed health benefits, that the amount of chocolate (or wine) that would need to be consumed to enjoy the rewards from the antioxidants contained would be such an enormous amount that the damage caused by the fat and sugar (or alcohol) would far outweigh the goodness done.6 Thus, the health benefits of chocolate, if any, must be attainable from a small amount, as its fat content is so high. Iron deficiency is not a huge issue at the moment, but with the amount of meat being consumed in the American diet coming under attack, alternative sources of iron might be important to a new generation of health and environmentally conscious consumers looking to eat considerably less meat, and with it the iron it provides. The number not yet mentioned, but most important when discussing the possible benefits or dangers of high cacao content chocolate is that of the fat, and especially saturated fat, content. The average saturated fat content from a single serving of one the eight brands mentioned previously is 58% of the recommended daily amount, according to the FDA packaging. This number is astronomically high. The dangers of saturated have been widely reported for many decades10 but recently there has been contention within the medical community. The British Medical Journal posted a controversial article in 2017 claiming “Saturated fat does not clog the arteries… Despite popular belief among doctors and the public, the conceptual model of dietary saturated fat clogging a pipe is just plain wrong.”13 The article came under fire, not for necessarily being outright wrong, but for being misleading.14 Fat is still something that should be monitored, whatever the type is being consumed. So, unlike a food source like a kiwi, which boasts enormous health benefits and can be added to any diet with no known drawbacks (unless one is allergic), chocolate can only be effectively employed as a source of nutrients to a diet low in fat. For many this is bad news. The United States Department of Agriculture’s Agricultural Research Service reports that only 40% of Americans are staying within the guidelines of consuming 10% or less of their calories from saturated fat.15 Ultimately, this means for a large section of society the only way to employ dark chocolate as a health food is if they restructure their diet to include significantly less saturated fats. What is exciting is the recent explosion of craft chocolate in the United States and beyond. Craft chocolatiers are typically willing to pay more for their beans, and as Dr Martin of Harvard University has written, “buyers must pay more for cacao, uncertified and certified. Both practically and morally, consistent cacao farmer poverty in an industry replete with wealth is unacceptable.”17 Craft chocolate is also inherently made from higher quality ingredients, and with an emphasis on a robust amount of cacao per bar. An often reliably healthier option than mass-produced chocolate. The craft chocolate market is still small and producers have for the most part stayed clear of buying beans from West Africa, where the bulk of ethical concerns lie. However, increase in chocolate consumption is rising rapidly according to an article publish recently in Vox, “Chocolate retail sales in the US have risen from $14.2 billion in 2007 to $18.9 billion in 2017, the market research group Euromonitor International found, at a time when candy sales overall have been waning.”18 If demand for craft chocolate increases, perhaps a future where farmers are able to choose to sell their beans to craft chocolatiers over mass-producing corporations is possible. Coe, Sophie D., and Michael D. Coe. 1996. The True History of Chocolate. New York: Thames and Hudson. Chocolate is the extraordinary and laborious product from cacao, processed into a gem for indulgence to all who enjoy eating it! As I reminisced about the early years of my life living in my beloved Venezuela, I thought fondly about the piece of chocolate that every Venezuelan loves to have: the medium-sized, lustrous ball of rich milk chocolate with a hazelnut inside that is an icon to Venezuela’s history of chocolate and culture – Toronto, made by Savoy. Sadly, the Toronto is no longer as exquisite as it used to be; its quality started decreasing in the 90s. Savoy is an established chocolate company in Venezuela. In this country, the quality of the chocolate industry has gradually declined when the political and economic faces of the country started to change more notoriously and up to this day, they are still carrying severe consequences. How is it possible that for Venezuela, a country that produces the best cacao in the world, the quality of manufacturing chocolate is decreasing? I believe that this is a political issue and to understand it, it is important to refer to the political history of Venezuela in the last twenty years. There has always been corruption in the Venezuelan government. However, Venezuelans have endured very radical challenges in the political, social and economic areas since the late president Hugo Chavez took office in 1998 who was followed by his successor Nicolas Maduro. It has been with this duo and their political and economic policies that have broken the foundation, the base, the pillars and the structure that sustain the country and its citizens. Many of the main issues that are seen today are caused by the dramatic massive inflation rates that soar every day, aggravated by the devaluation of the Venezuelan currency, el bolivar (1B). The threat of a steadily devaluating currency brought fears of massive capital fight and flight to quality (BBC2013). In theory, the government offered businesses the purchase of the “preferential dollar”, which in other words is American dollars at a much lower and fixed rate than what is sold in the black market. However, when businesses submitted the requirements to obtain the currency to import materials and goods, the actual truth came out: there is no such preferential dollar. This policy was built on lies so that business owners were forced to purchase dollars in the black market so that they could supposedly import the goods as well as purchase materials and ingredients for production. Although Venezuela’s oil revenue was so lucrative during the Chavez administration and his predecessor’s administration, Carlos Andres Perez, Chavez proclaimed cacao as a very strategic national product in 2010 (Sputnick 2010). Yet, the economies of these two products are incomparable because of their quantity production, time and revenues. Venezuela is known as the country with the best cacao of the world and owning the most precious and the most sought of all: the criollo. Maricel Prescilla, author of The New Taste of Chocolate, states “it is one of the most harmonious and symphonic cacaos. Even the lowliest cacao in Venezuela is fine cacao” (2015). The criollo cacao is cultivated mainly in the town of Chuao which is comprised of a small village of fishermen and it is reachable only by boat from the coastal shores of Choroni. In the class Chocolate, Culture and the Politics of Food at Harvard Extension School, Dr. Carla Martin lectures students about the unique experience of this farm where the process of criollo cacao is still processed as it was done in the 1500s and 1600s, all through manual work. It is important to know that Venezuela has various regions of cacao farms and not all these farms are equally the same. They vary in climate, geography, care, irrigation, geology and soil conditions that interact with the plant’s genetics. This concept is called Terroir; different terroir, different flavors in chocolate (spring 2017). I recently spoke with Mr. Victor Guama, a cocoa worker in one of Chuao’s cacao farms. During the phone conversation, he informed me about the process used on this cacao, which is mainly done by women. It is also very important to note that Chuao has many cacao farms where the employees have been and continue to be comprised of generations of families. It seems that they are born to carry on the tradition! He happily says that his mother worked in the cacao fields for forty-four years and his aunt has been working there for thirty-three years. I can sense the pride in his voice when he said that they “are so proud to work for the best and finest cacao in the world, especially when it is produced in our hometown of Chuao, Venezuela. It is very hard work, and we care about it.” In the farm, there are approximately 124 women who harvest the cacao pods, extract the seeds and pulp, begin the fermentation cycle, put them to dry in the sun, and sort and bag the beans so that they can be transported by the 10 men who do the heavy lifting in the farm. Sophie and Michael Coe, authors of The True History of Chocolate write “through fermentation and drying , the cacao’s pulp-surrounded seeds are converted into nibs ready for roasting and grinding into chocolate liquor (105)” Interestingly, Victor also informed me that 75% of the cacao production is sold by contracts to Europe, especially in France and 25% stays in Chuao to make artisanal chocolate. Victor proudly talks about the excellent quality of the criollo cacao harvested in this area, pointing out that the key of its fine quality and distinctive flavor is due to the irrigation system done with the water coming down from the river. Surprisingly, he also said that as cacao workers, the previous administrations before president Chavez never provided job security and benefits to the workers, but Chavez did. Sadly, Chavez’s successor, president Nicolas Maduro eliminated them. These cacao workers are uncared for and underprivileged because the income they receive does not compensate the amount of work and hours they put into the process of the best cacao in the world, especially during the current regimen and difficult time that Venezuela is going through. Whether or not Savoy produces its own cacao is unknown, however, since 2012 they offer Plan-Cacao Nestle as an integral support program to cacao producers that encircles the producer, family and community as it is shown in its website. Although it presents a list of objectives, it projects vague information. Savoy claims in its website that they make their chocolates with the best cacao in the world, but this claim leads to unanswered questions such as where the cacao comes from. I would look at Savoy’s history. Savoy opened its doors in Caracas, Venezuela in 1941 by three Swiss brothers. In 1988, Nestlé, a transnational corporation, acquired Savoy and substituted the original crown logo above the name of Savoy for the Nestlé logo on all the packaging. The Savoy company is considered a Venezuelan patrimony and is the primary chocolate company. Even with the decline in quality in recent decades, Savoy chocolates continue to be loved by consumers. Although there is a significant difference between the chocolates that were manufactured more than twenty years ago versus those that are manufactured today, I believe that the problem is not the cacao itself, but more so the quality of the manufacturing process of the various products. It is here where the politics of food plays a very important role in the production and quality control of Savoy manufacturing because the true ingredients are not available. Regardless, there are very noticeable characteristics in the chocolate that a fine Venezuelan chocolate bar should not have which are shown in the image below such as white marks and a bland brown color. Through the years of the industrialization of chocolate, Savoy is well known for the following products: Cri-Cri, made of crispy rice covered with chocolate, Bolero, a crunchy corn covered with chocolate, and Ping-Pong, the classic crunchy peanut covered in chocolate. Yet, the most popular of all the products is Toronto. It is the one that most Venezuelans, especially those living out of the country, remember with excitement and nostalgia. It is the one that brings memories of relationships between family, friends, school and communities to our lives. It is the one that is always well-received as a gift from relatives and friends coming from Venezuela. I clearly remember the original Toronto as a very rich, fine milk chocolate bombón with a very smooth texture and an impressive satin look that had a deep brown colored hazelnut inside. It melted in my mouth as I ate it, leaving a very pleasant and savoring flavor in my mouth. It was my favorite chocolate! Sadly, this was then. The new Toronto made today from the 90s is tasteless, dry on the outside, and greasy on the inside. It has a boring, bland brown color, breaks into pieces when in my mouth, and its size continues to shrink. Again, a fine piece of Venezuelan chocolate should not have traces of white marks inside as shown in the image below- it almost seems as if the chocolate is old. There is a large difference between the two eras of Savoy’s chocolate making. My daughter’s generation enjoy and love the new Toronto! When I narrate to them the Toronto of my time, which I used to eat with so much pleasure, they cannot make a connection because they have never tried it and most likely never will. A Savoy retail store located in what used to be a very popular commercial and residential area of Caracas called Boulevard Sabana Grande, used to sell bags of “recortes de chocolate” or “chunks of chocolate.” They were sold by the kilo in clear cellophane bags wrapped in a bow at the top. My job’s office was on the same street side where this Savoy store was and I never failed to buy several bags every quincena or 15 days. Savoy has a long-lived trajectory of a great market and loyal customers who are very proud of these chocolates. Savoy’s trademark, “Con Sabor Venezolano” or “With Venezuelan Flavor” still lays under the oversized Savoy billboard above a building that overlooks the main highway in Caracas, Venezuela. This Savoy sign is equivalent to what the Citgo sign means to Boston! Savoy remains the chocolate choice of the Venezuelans. They are proud to have an industry that has continuously worked for 75 years, especially since Hugo Chavez expropriated thousands of international investments and production companies in the country, including our own oil companies. The journalist Ileana Magual from El Universal newspaper writes “One of the icons and jewel in the crown of Venezuelan gastronomy is the cacao, known to be the best in the world. Talking about Venezuela is talking about our unbeatable cacao, our gold vegetable. It used to be shipped, turned into a beverage, and used as an offering and currency by our first settlers who called it ‘the money that grows on trees’” (2015). I hope that the future of the Venezuelan cacao will never vanish because it is a heritage of the land with fertile soil and infinite roots in the trees. As Marisel Presilla writes “where there is cacao, there is life. No tree has more to teach us than cacao, when we take the trouble to see it in its own environmental and biological context (7).” Cacao is the gross domestic product that makes the economy of cacao communities and their generations work for the love of cacao. Based on my research, I do not believe that Savoy uses Venezuelan cacao made in places such as Chuao, however, it could be possible that their chocolates would improve in quality if they did. I wish that my daughter’s generation and the generations to come will someday experience the delightful pleasure of eating the real Toronto just as I dream of Venezuela returning back to the versatile and stable country it once was. Until then, I will continue searching for the chocolate that reminds me of all the fond memories from my childhood in Venezuela! Prof. Carla Martin. Chocolate, Culture and the Politics of Food. Personal Communication. Harvard Extension School. Spring 2017. Victor Guama. Telephone interview. May 6, 2017. In Europe and the America’s during the Enlightenment Period of 1685-1815 chocolate traditions expanded dramatically. The Enlightenment was a period in time when traditional authority such as the Roman Catholic Church was questioned and scientific process and free thinking were introduced and encouraged. This shift in attitude and thinking also influenced chocolate traditions in Europe and the Americas. chocolate as medicine, image from google images. During this period the tradition of drinking chocolate at home or with others in a small group in an intimate setting transformed to enjoying drinking chocolate socially in large groups. In the North of Italy the cooks were very adventurous with their use of chocolate in their recipes and included it in their pasta and meat dishes. One particular recipe for lasagna mentioned in the 1786 manuscipt frm Macerata includes a “sauce made of almonds, anchovies, walnuts and chocolate.” ( Coe, 215) As a big fan of pasta sauce, lasagna and chocolate, I must admit the thought of chocolate and anchovies in the sauce on my lasagna does not appeal to me. Thankfully, the tradition of using chocolate in main dishes that include meat and fish did not last. However, the tradition of chocolate as an ingredient in desserts with flour , sugar, fruits and nuts has continued to be popular in Europe and the Americas. Many of the chocolate traditions of the Enlightenment era continue today including chocolate confections, baked goods and drinks. We still enjoy chocolate as a hot drink, although today we drink it from ceramic mugs and do not usually use a molonillo to whip up a froth. Desserts and chocolate continue to be a perfect combination and includes such delicious treats as chocolate cake, chocolate pudding, chocolate bars , nuts covered in chocolate and chocolate biscuits to name a few. The introduction of chocolate to Europe plays a significant role in the transformation of customs and beliefs that are currently associated with it. As chocolate expands into European countries, it has major implications on matters of class and politics. The development of these beliefs is best viewed through a historical narrative of chocolate’s evolving role in European society. Until the 16th century, drinking chocolate was an unknown custom to Europeans. Although Christopher Columbus allegedly encountered cacao beans on one of his missions to the Americas, it was Hernan Cortes who was the first European to taste chocolate (Presilla, 2009). Initially, he found the drink “more a drink for pigs, than a drink for humanity (Coe & Coe, 2013, p. 110). However, through their relations with the Aztecs, the Spanish became aware of the value of cacao beans (Presilla, 2009). After the Spanish conquest of the Aztecs, chocolate was imported into Europe and quickly became popular among the elite. While it was still served as a beverage, the Spanish altered its taste by adding honey or sugar to reduce the bitterness (Presilla, 2009). This “Hispanicized chocolate” expanded into England, Italy and France quickly after its discovery (Presilla, 2009, p. 25). Although the taste of the chocolate was slightly altered, Europeans continued to associate drinking chocolate with high social standing (Presilla, 2009). Drinking chocolate was still considered a luxury and was primarily consumed by the elite. This is mainly because it took a great deal of effort to produce the beverage. 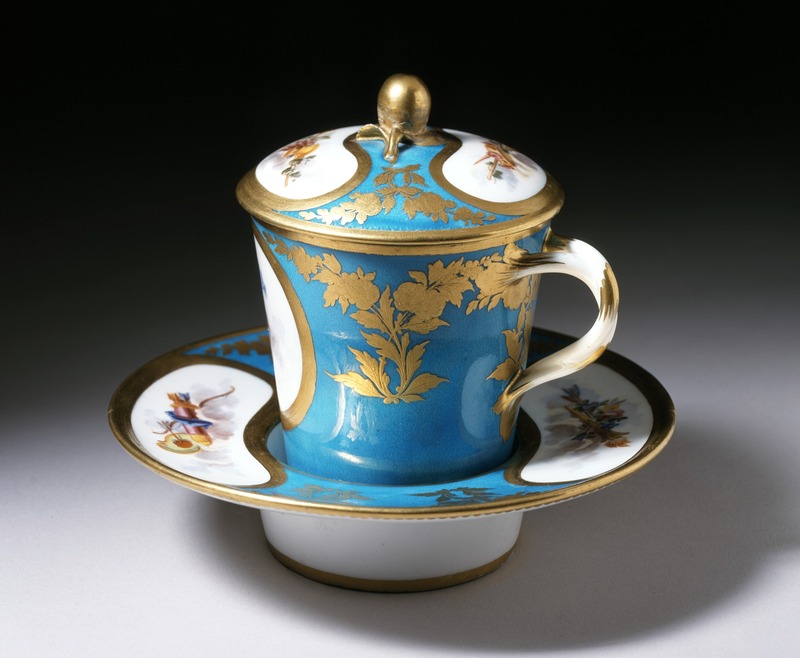 Furthermore, it was custom to drink chocolate from luxurious utensils, such as the Spanish mancerina and French trembleuse cups and saucers (Presilla, 2009). These images symbolize the integration of drinking chocolate into elite customs as well as the formal nature by which chocolate was consumed. Thus, the consumption of chocolate in Europe was historically associated with matters of wealth and class that provides meaningful insight into the customs that developed as a result. While chocolate consumption is Europe became a custom tradition among the elite class, it was also associated with political issues (Coe & Coe, 2013). This is particularly prevalent in England as the chocolate beverage became popular during a time of “political and social upheaval” (Coe & Coe, 2013, p. 161-162). There were tensions that existed between the king and parliament that were exacerbated by regular meetings that would take place at English coffee-houses. These coffee-houses hold political significance as their popularity threatened the King’s authority and he tried multiple times to have them shut down. Along with coffee and tea, chocolate beverages were sold at these coffee-houses and all three items were highly valued among the customers. Since chocolate beverages were frequently consumed during political meetings at the coffee-houses, it became symbolic of a democratized England. In conclusion, a historical analysis of chocolate’s consumption in Europe highlights associations with matters of class and politics. Along the way, its consumption was specified to the elite classes and held certain political affiliations, particularly in England. As a result, certain customs and beliefs became tradition among European societies that have played an integral role in shaping our current fascination with chocolate. 1. Coe, S., & Coe, M. (2013). Chocolate conquers Europe. In The true history of chocolate (Third ed.). New York: Thames and Hudson. 2. Presilla, M. (2009). A natural and cultural history of chocolate. In The new taste of chocolate: A cultural and natural history of cacao with recipes. Berkeley: Ten Speed Press.